Geologically, White Acres is an extension of the hogbacks of Red Rock Canyon Open Space. It spans the same geology from the Niobrara formation through the Morrison formation. 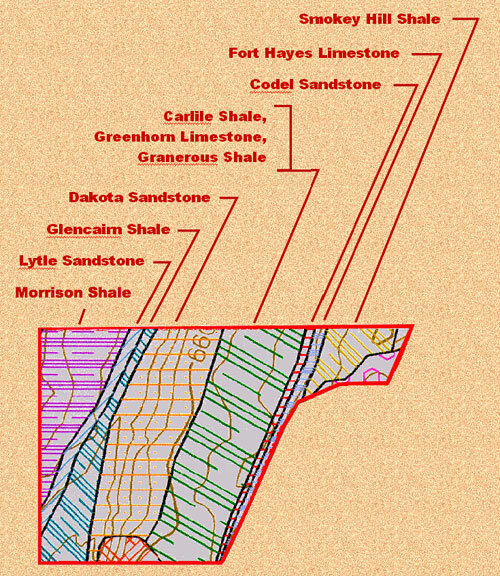 The primary geologic exposure is Dakota sandstone which is seen in the prominent east faces. Except for the Jurassic age Morrison formation, the sedimentary geology is all from the Cretaceous period. The plant communities of White Acres are similar to those on the hogbacks of Red Rock Canyon Open Space. Much of the east slope and ridge crest areas of the property can be described as Mountain Shrub Community characterized by Gambel oak, mountain mahogany, and thee leaf sumac. Here, the Mountain Shrub Community takes different forms, dense stands of Gambel oak and areas of sparser mixed Gambel oak and mountain mahogany with an understory of mixed grasses. Conifers, mostly ponderosa pine, are scattered among the shrubs becoming more abundant toward the west leading to somewhat of a gradation from a Gambel oak, mountain mahogany Mountain Shrub Community to a Ponderosa oak community to a cool conifer forest toward the northwest corner of the property. Open grassy areas along the bench at the base of the Dakota hogback are extensive enough to possibly be considered to represent a mixed grass community. Since much of the property has experienced relatively little human impact for nearly a century, it is generally less weedy than much of Red Rock Canyon Open Space.